There are two Fit Testing methods, these are known as: Quantitative andQualitative tests. 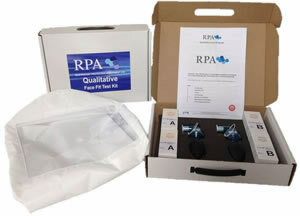 RPA can provide both Qualitative and Quantitative tests, on-site throughout the UK. Quantitative tests can be used to fit test all types of tight-fitting masks including disposable, half and full face masks. Quantitative tests give an objective assessment of facial fit and provide a direct numerical result called a Fit Factor. The most widely-used quantitative method for RPE fit testing is the Particle Counting Device method, a title ascribed to the TSI Portacount Plus. 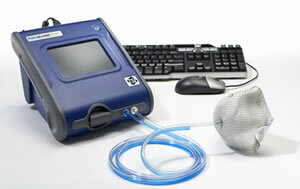 The Portacount Plus measures the number of ambient particles inside and outside a facepiece and provides a numerical result which is the ratio of the two over a given test period. Qualitative tests rely on the wearer’s subjective assessment of faceseal leakage. These methods, during a set of test exercises, use the wearer’s sense of smell or taste to detect faceseal leakage of a test agent.Qualitative tests are subject to problems with sensitivity, lack of objectiveness and inability to provide a numerical result. For these reasonsQualitative tests can only be employed for fit testing of filtering facepieces (disposable masks) and half masks, not full face masks.